Description: This original copper plate engraving is designed, engraved, hand-printed, painted with watercolor and signed in pencil by artist Timothy Jon Struna. The edition is limited to 100. 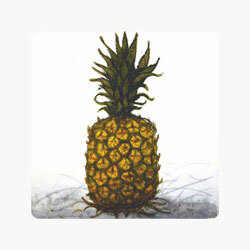 A welcome sign to all who enter a friendly house, this icon of the "Pineapple" can be seen on houses across New England.